Bulding materials, such as cement or concrete, require a very specific final packaging with total protection against external agents such as humidity, rain, etc. 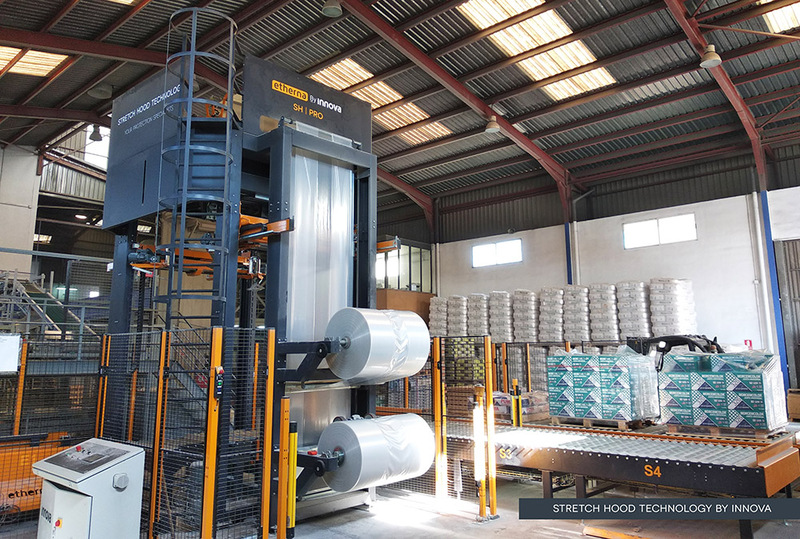 Answering this requirement, the Stretch Hood packaging system has already become one of the preferred solutions in the sector, as it guarantees greater protection and superior finishing for product with very specific needs. 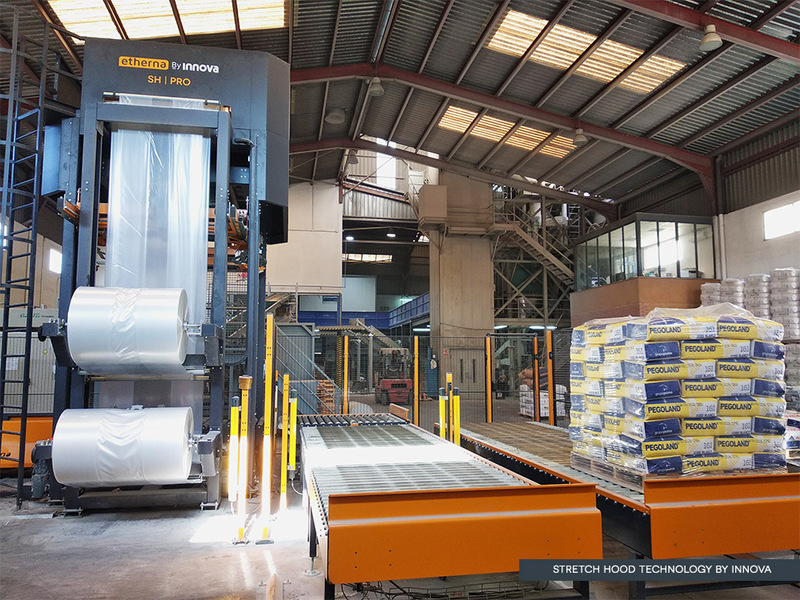 In this context, Grupo Puma, one of the leading Spanish companies in construction materials, chose Innova’s Stretch Hood system to protect its products and automate the end of line production at one of his factories in Valencia (Spain). Grupo Puma is one of the building giants in Spain, with 21 production centers in Spain and Portugal and an export network of more than 40 countries. Puma specializes in construction materials with an extensive range of mortars, adhesives, paints and insulation systems. Precisely its commitment to the latest technologies and sustainability with environment has been one of the motivations for choosing an innovative system like the Stretch Hooder by Innova, which allows more efficient and sustainable packaging processes. 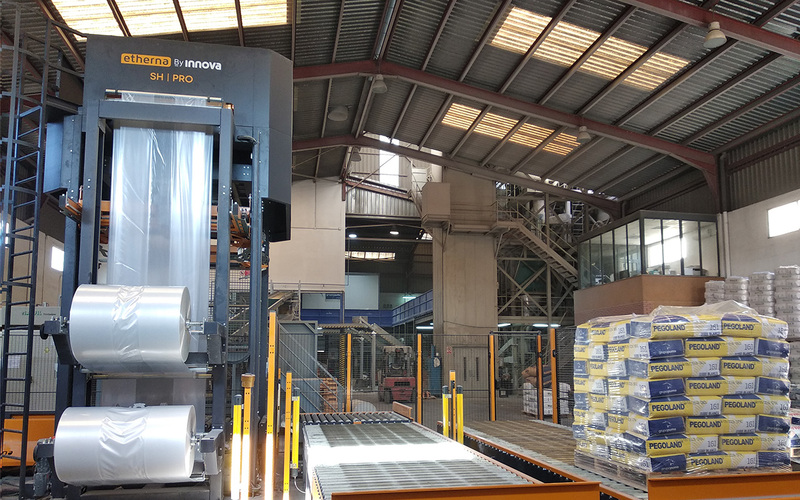 Grupo Puma needed greater protection for its mortar pallets: At the time they were using an automatic wrapping system that incurred in incidences related to humidity inside the final packaging. In addition, Puma was looking for a better finishing with the the Stretch Hood film. 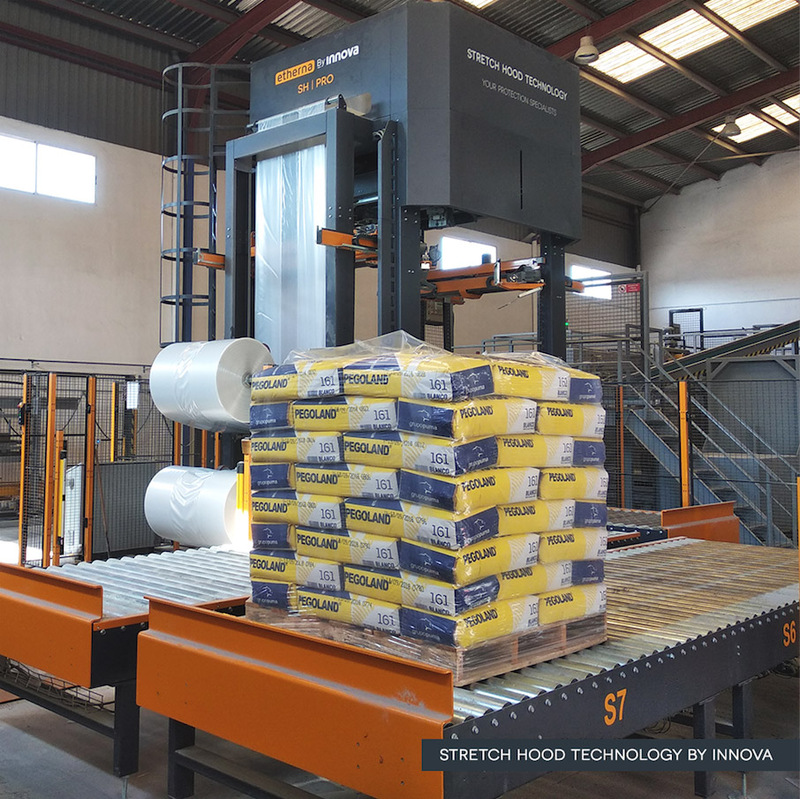 Innova proposed its most powerful model of Stretch Hood (SH Pro 2 S2) with the capacity to pack 150 pallets / hour and several sizes of loads with two Stretch Hood film reels. This solution allows Grupo Puma to wrap several types of pallets, with the same quality, finish and lower consumption of film. Actually, the Stretch Hood system calculates automatically the exact film that is needed in each packaging according to the size of the pallet. Therefore the use of film is optimized, contributing to a saving in consumables and energy. The packaging project in its Valencia factory consisted of a packaging line composed of Stretch Hood ETHERNA SH | Pro 2 S2 and its respective conveyors: transfer system, pneumatic centering, hydraulic lifts, transfer with rotating platform and 8 pallet accumulation conveyors. All was designed, manufactured and installed by Innova. In fact, the composition of the study project was highly customized for Grupo Puma, with a maximum optimization of the space available in the factory. The innovative and graceful design of the Innova machinery was decisive when locating the entire packaging line. The installation was carried out last April 2018, and since then Grupo Puma has shown Innova more than satisfaction with the service and attention received throughout the whole process. For Innova, it is a pleasure to work with such a leading group in the construction sector as Grupo Puma.